The Vintage Cosmetic Manicure Purse Pink Floral Satin makes a wonderful gift. Use the Clipper to cut, the Scissors to trim, the Cuticle Pusher to ease back cuticles and Emery board to smooth. Sophisticated and flawlessly retro, the floral design is replicated on the stainless steel manicure tools. Your nails will thank you for the TLC! Explore the entire range of Manicure & Pedicure Kits available on Nykaa. 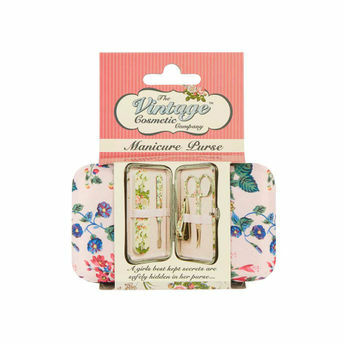 Shop more The Vintage Cosmetic Company products here.You can browse through the complete world of The Vintage Cosmetic Company Manicure & Pedicure Kits .